Looking for a change from cooked Brussels sprouts? 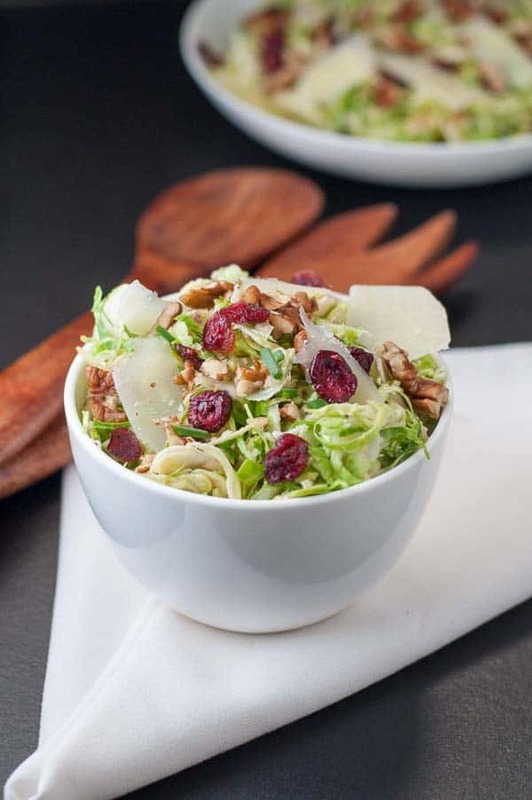 Try this raw shaved Brussels Sprout salad instead! Sweetened with apples and cranberries, it’s a perfect side dish for a fall or winter meal. This Shaved Brussels Sprout Salad is a favourite in our home during the winter months. 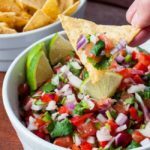 I originally published this recipe a few years ago, but it’s just so good (and good for you) that I’ve added new photos, new instructions, and bumped it to the top! With fresh produce readily available in the summer, salads are easy to create. In the winter, we have to be a little more creative. 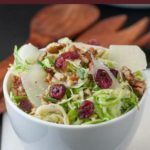 This Brussels Sprouts salad with Cranberries and Pecans has sweetness from apples and cranberries, saltiness from cheese, and crunchiness from pecans. It’s a fresh alternative to the traditional way of serving sprouts. 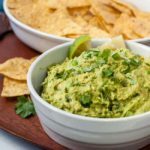 If you haven’t tried raw shredded Brussels sprouts, here’s a perfect way to do so! Head to your farmer’s market, pick up some freshly harvested sprouts and make this raw salad. Childhood memories of the smell of boiled or steamed Brussels sprouts prompted me to seek other ways to prepare this nutritious vegetable! I grew up believing that the only way to eat Brussels sprouts was to boil them to death until the stench filled the kitchen. Thankfully, my mother usually only cooked Brussels sprouts for holiday dinners, so my suffering was just occasional. Raw Shredded Brussels Sprouts are delicious! It wasn’t until I was all grown up and began cooking for myself that I discovered there are many delicious ways to serve sprouts. Those who have never tried them raw may be surprised to see them served this way. Often the most confirmed sprout-haters become converts when trying them in a salad. 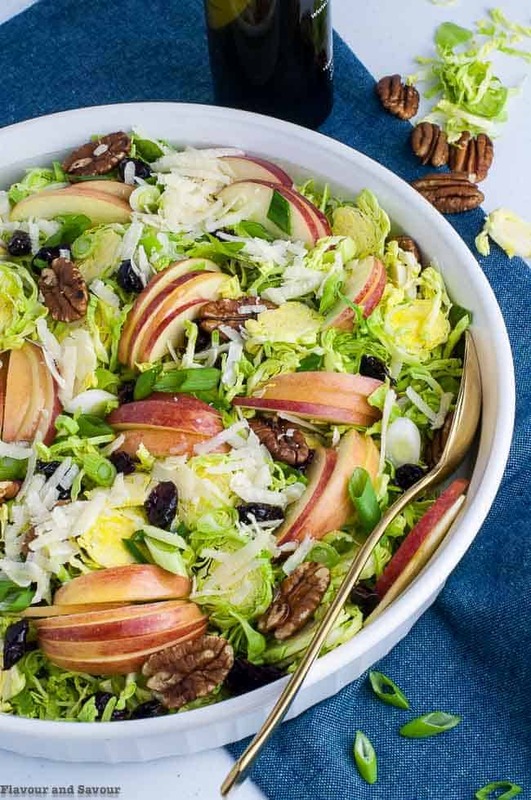 You might also like this Fresh and Crisp Kohlrabi Winter Salad. It uses raw Brussels Sprouts leaves instead of lettuce. How do you shred or shave Brussels Sprouts? Shredding the Brussels sprouts makes this salad almost like a slaw, but the sprouts stay fresh and crunchy. There are several ways you can shave sprouts. Use a mandoline, but take extra care as sprouts are small and the blade is very sharp! The slicing disc on your food processor will quickly transform these little cabbage-like veggies to a mound of feather-light fronds. Slice with a sharp knife, then separate the round slices into ribbons. and a fresh change from traditional cooked sprouts! Toss shaved Brussels sprouts with the remaining ingredients and a maple-balsamic vinaigrette and you have an ideal salad for a fall or winter day. 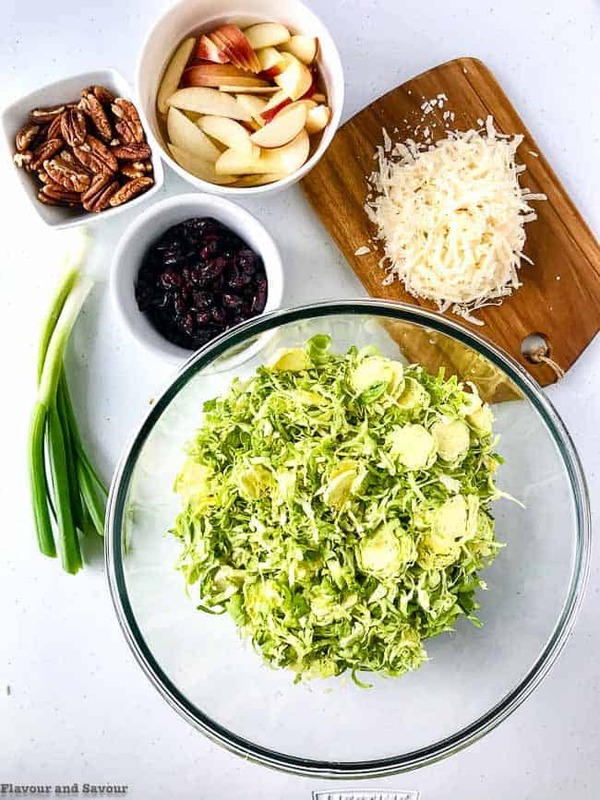 Sweetened with apples and cranberries, this shredded Brussels Sprout Salad is a perfect side dish for a fall or winter meal. Heat oven to 400°F. Lay the pecans on a baking sheet and toast in oven for 6 - 8 minutes or until fragrant and lightly browned. Remove from oven and let cool before chopping. Trim the sprouts to remove any bits of rough stem or discoloured leaves. 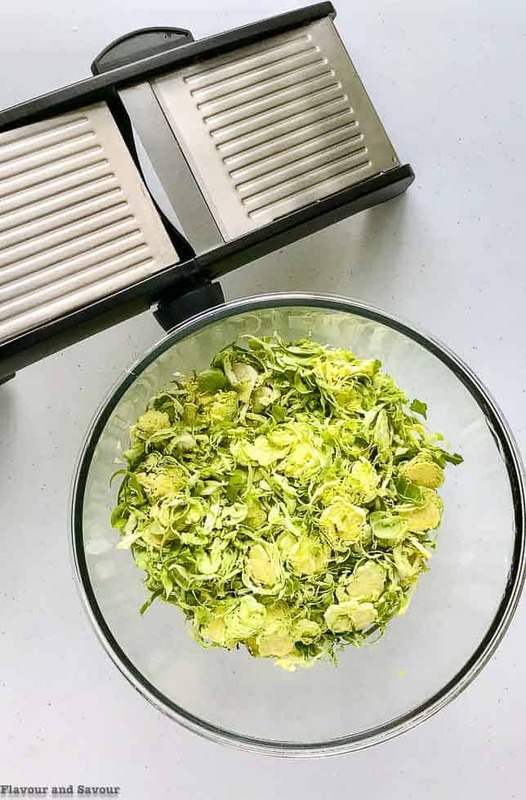 Shred the Brussels sprouts, using a mandoline (be careful!) or the slicing disc on a food processor, grate coarsely, or use a sharp knife to slice. Thinly slice or grate apple into a small bowl and toss with the lemon juice to prevent browning. Grate the cheese and combine all salad ingredients. Whisk the vinaigrette ingredients together and toss the salad. 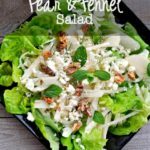 Looking for other winter salad ideas? Thanks Dawn! Hope you love it as much as we do! Happy holidays! Love this salad! We do love raw Brussels sprouts and here with the combination of ingredients you added, they shine through! Crisp, fresh, delightful, perfect side for the “heavier” holiday main dishes!! Thanks Nicoletta, Happy holidays to you both! 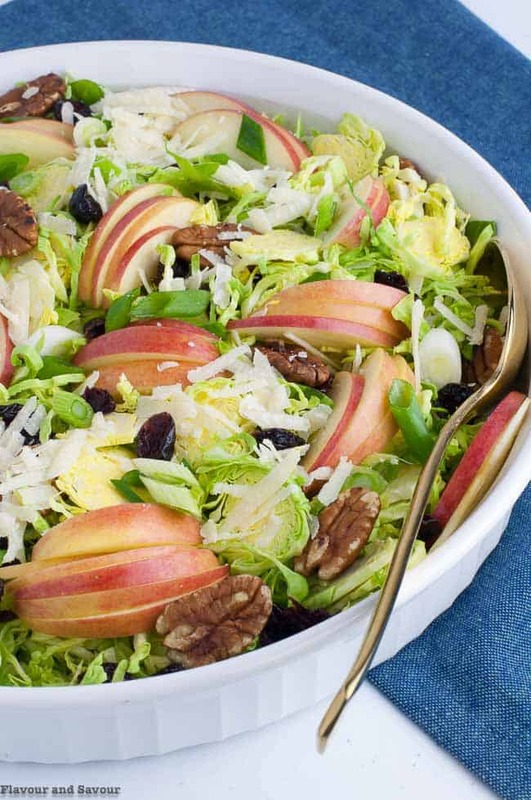 I always see shaved brussel sprout salads and they look so pretty and delicious. I keep meaning to make one. This looks great Elaine! Love the addition of apples and cranberries! Thanks Leanne! Hope you get a chance to try it soon. Happy holidays! My mother must have felt the way you did about Brussels sprouts, because she never served them cooked or otherwise. It was my husband who introduced them to me. Even then it took quite awhile for me to come around to liking them. I enjoy them roasted or fried now, but love them in this salad! Thanks Cathy! It’s a nice alternative to cooked sprouts. Sometimes I just sprinkle a small amount of shaved sprouts in a mixed green salad too. 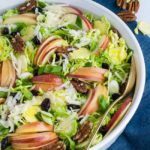 I adore Brussel sprouts any way that I can get them and your recipe for Brussel Sprout Salad with Cranberries and Pecans sound divine, Elaine! 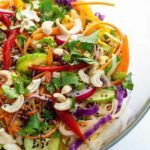 I could see making this salad often – the ingredients are all favourites of mine. And that dressing sounds like a perfect pairing with the Brussel sprouts. Thanks so much for sharing. Happy Holidays! Thanks so much Denise! Happy holidays to you, too! Wow. 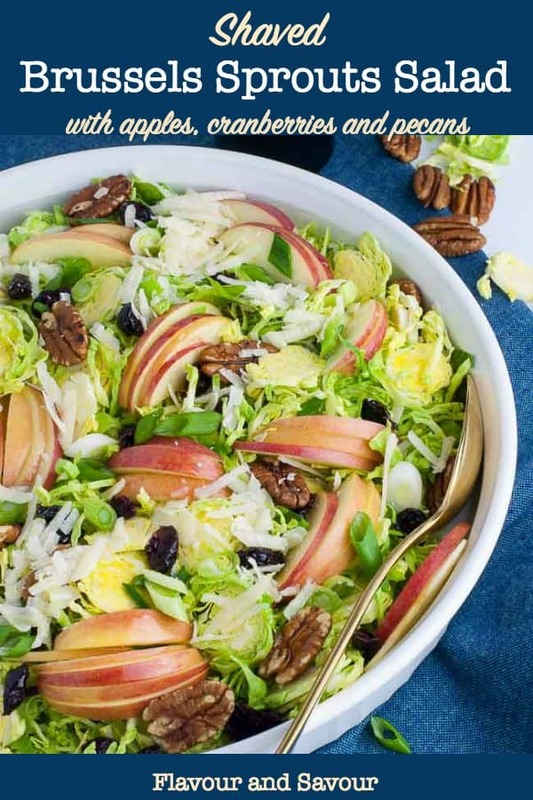 I have to admit that I’m not the biggest Brussel sprouts fan, but this salad looks so amazing that I think I have to try it! I can imagine the flavor combination from everything else and it tastes really good in my mind! Love it! Just have to track down Brussel sprouts in Hong Kong so I can make it now! Thanks so much, Katie! Looking forward to seeing the other recipes in your roundup!